Our malware researchers have classified Web Protector as an adware type application that is very unreliable because it displays advertisements provided by various shady entities. So our researchers advise you to remove this application because it has no added value to the end user. Indeed, this application is more than just useless: It obstructs your browsing experience by showing annoying commercial advertisements. That is bad enough, but, nonetheless, the content featured on the ads has been linked with malicious websites that contain malware download links. So you should definitely remove Web Protector if you want your computer to remain malware free. Our researchers say that Web Protector is only a half-working infection. Most of the time, the adware is idle and does not perform any malicious activities. However, when it wakes up from its dormancy state, it begins to display pop-ups featuring Adobe flash player updates. Its idling state could depend on the geographical location and time zone of the host computer. So, if you have not noticed ads by Web Protector, you might be caught off-guard and think that the pop-up is legitimate. Please do not fall for this trick, because, if you do, you might have a serious problem on your hands. Clicking any of Web Protector’s ads could have disastrous consequences, because the malware your computer could get infected with could range from mildly harmful browser hijackers to extremely dangerous ransomware and fake antimalware scanners. Note that if you get infected with ransomware, it could steal personal files or corrupt them beyond repair, damage hardware components, or lock your computer and demand that you pay a ransom. On top of that, if you get infected with a fake antimalware scanner, it could show you an offer to buy a full version of the program. If you enter your banking credentials. The program might rob you of all your hard-earned money. This infection is very similar to Site Finder that was released recently. Web Protector has retained all the malicious traits of its predecessor. To date we do not know how this infection is distributed, but it is quite possible that this infection is bundled in freeware bundles. At any rate you should remove this application because, as you can see, it is malicious in nature and does not perform any useful function. If you have decided to remove Web Protector from your computer, you are welcome to use our manual removal guide, which will guide you through the removal process step by step. Alternatively, you can use an anti-malware scanner that will remove this infection for you. 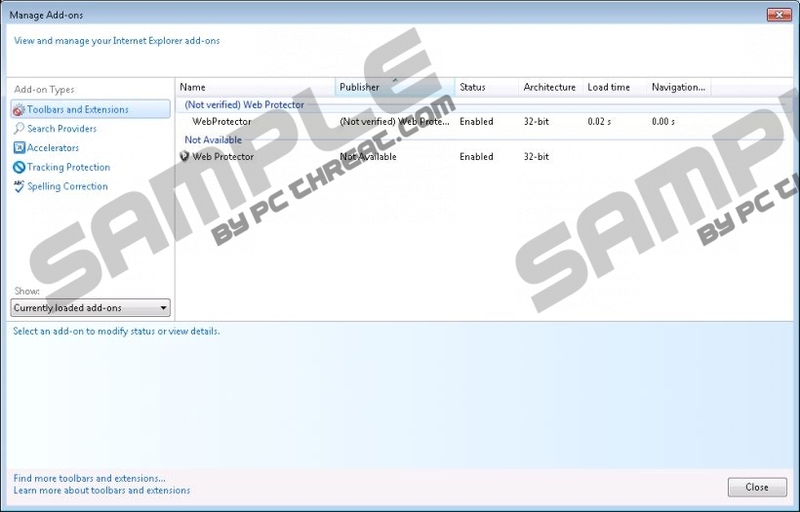 Find Web Protector and click Uninstall. Quick & tested solution for Web Protector removal.